During my research on representations of Islam and Islamic cultures in the Victorian period, I've come across many fascinating details of daily Muslim life in nineteenth-century Britain. Shown above is the Shah Jahan (or Jehan) Mosque in Woking, Surrey, northern Europe's earliest surviving purpose-built mosque. It was commissioned in 1889 by Hungarian-born linguist and scholar Dr Gottlieb Wilhelm Leitner (1840-1899; shown at right; Wiki entry here). Leitner was educated in Istanbul (after the death of his father, his Jewish mother had married a Protestant missionary stationed there). A master of several languages, he became Professor in Arabic and Muslim Law at King's College London at the age of 23; a few years later he was named Principal of Government College at Lahore (now the University of the Punjab). 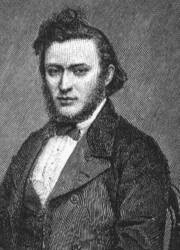 On his return to England in 1881, he established an "Oriental Institute" in Woking to prepare Asian students for careers in the professions and to offer language training to Europeans wishing to live and work in the East. 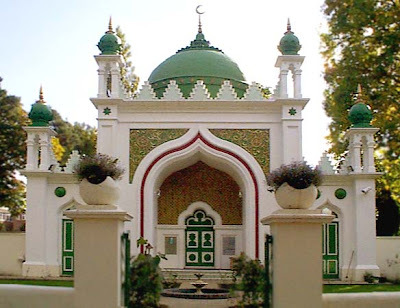 To provide a place for the Institute's students to worship, and funded by generous donations from Nawab Mahbub Ali Khan (the Nizam of Hyderabad) and the Begum Shah Jahan of Bhopal, Leitner acquired land near the Institute and set about building a mosque to a design by English architect W. L. Chambers. 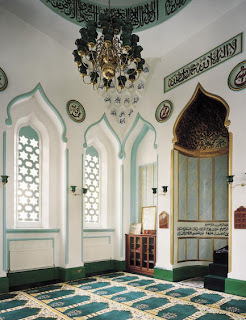 English Heritage described the mosque in a 2004 report: "Although small in scale, the building is dignified and well proportioned, square on plan, with a wide, welcoming portal flanked by apsidal pavilions providing facilities for ritual ablutions. The interior [shown at left], under a spherical dome, is simple, with calligraphic decoration its principal enrichment. Gold stars dot the interior of the dome, and the principal focus of the small space is the niche in the east wall, the mihrab, indicating the direction of Makkah [Mecca]." 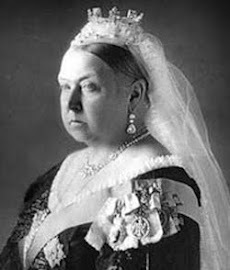 While the students of the Institute were the most regular worshippers, the mosque also served the wider Muslim community, including (reportedly) Queen Victoria’s Indian attendants. The mosque fell into disuse after Leitner's death in 1899; it remained closed until 1912, when it was acquired and reopened by Indian lawyer Khwaja Kamal-ud-Din of Lahore. It has been the centerpiece of Muslim life in Woking ever since. I invite Peeper readers with a special interest or expertise in nineteenth-century British Islam to get in touch with me. What an interesting post. Thanks. 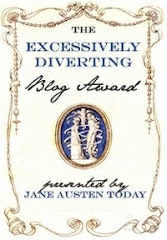 I just want to say that I really enjoy reading your blog. Thanks very much for reading and for your kind comments! I like your approach to history very much! Lovely blog! I just did a blog a couple of days ago on the Pre-Raphaelites and the Victorian Ottomans. FYI! I hope to link to this blog from mine! It's been a while since I dropped by, and boy, have I got a lot of reading to catch up on! A colleague is working on an exhibition to do with history and relationships between Europe and the Islamic world . I'll be sure to point him to this post. Thanks for sharing. Hi, Adline, welcome back! Yes, please do put your colleague in touch with me...I'd be happy to consult with him.